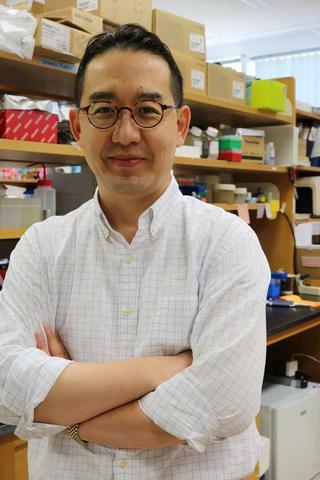 Dr. Minsoo Kim is Dean's Professor of Microbiology and Immunology and Director of the Tumor Immunotherapy Research Program at the Wilmot Cancer Institute, and a member of the David H. Smith Center for Vaccine Biology and Immunology. His research interests are in the area of innate and adaptive immune responses and cancer immunotherapy. He is especially noted for his pioneering contributions to the developments of the most advanced imaging techniques that enable real-time observation and control of dynamic immune responses both in live cells and live animal models. Precise spatial and temporal regulation of cell migration is critical not only for normal immune responses, but also for successful organ development, wound healing, and tumor metastasis. Integrins, a family of membrane receptors, are expressed in all different types of cells in human body and regulate important cell adhesion and migration. Early in his career, Dr. Kim developed a highly innovative bio-imaging assay using FRET (Fluorescence Resonance Energy Transfer) techniques and show for the first time in live cells that the intracellular domains of integrin LFA-1 moved apart substantially during immune cell migration, and his paper describing this (Kim et al. 2003, Science) has been highly cited and is regarded as a cornerstone of the integrin field. Dr. Kim has continued to develop this area in his lab in Rochester, establishing a role for conformational change in other important integrins like Mac-1 and VLA-4. Dr. Kim has continued to break new ground, most recently with the identification of important cross-talks between the innate immune and adaptive immune systems during influenza virus infection. This study, published in Science in 2015, developed from the Kim lab's careful observation of innovative fluorescence markers, using their high-resolution live animal imaging technique. In this paper, Dr. Kim showed that, much like birds fly in flocks to conserve energy, dolphins swim in pods to mate and find food, and colonies of ants create complex nests to protect their queens, immune cells engage in coordinated behavior to wipe out viruses like the flu. The findings reveal, for the first time, how immune cells work together to get to their final destination - the site of an injury or infection. The Kim lab discovered that neutrophils - the "first responders" of the immune system - arrive at the site of injury within an hour of infection and leave a chemical "trail" behind them. Killer immune cells called T cells use this trail to find the site of injury and subsequently destroy the virus. This study led to the important paradigm that the adaptive immune system doesn't generate the successful response without instruction from the innate immune system. This novel concept will be highly influential and are of special interest to clinicians. For example, in people with autoimmune disorders like multiple sclerosis and lupus, the immune system mistakenly attacks and destroys healthy body tissue. If scientists understood how to disrupt or stop immune cells' movement to healthy tissue, they may be able to improve the quality of life of people living with these devastating diseases. Similarly, recognizing how to boost the number of immune cells that travel to fight an infection could help scientists design better vaccines for viruses like the flu. Dr. Kim has continued to develop sophisticated new biomedical technologies. Recently, he established a remarkable optogenetic system in which he constructed hybrid receptors that connected the light-sensing properties of rhodopsin to the signaling functions of two chemokine receptors. In this ground-breaking study, his carefully-constructed system allows the migration of T cells to be controlled by light, e.g. attracting more effector T cells into local tumor sites and reducing tumor growth. The achievement of functional hybrid photosensitive receptors represents a real tour de force, and opens up many analytical and therapeutic possibilities. This is particularly important because of the increasing success of adoptive cell therapies for cancer – Dr. Kim's optogenetics approaches will provide further capabilities to such cells. Kim HR, Mun Y, Lee KS, Park YJ, Park JS, Park JH, Jeon BN, Kim CH, Jun Y, Hyun YM, Kim M, Lee SM, Park CS, Im SH, Jun CD. "T cell microvilli constitute immunological synaptosomes that carry messages to antigen-presenting cells." Nature communications.. 2018 Sep 7; 9(1):3630. Epub 2018 Sep 07. Chapter Title: Fluorescence resonance energy transfer in the studies of integrin activation. Chapter Title: Adhesion Molecules: Function and Inhibition.